The emigrant ship Hibernia, on passage from England to Australia, fell victim to sudden and uncontrollable fire in the south Atlantic ocean on 5 February 1833, and her survivors took to her few, and decrepit, boats. Had they not been picked up a week later by the reluctant convict transport Lotus, bound for Van Diemen’s Land (Tasmania), we would today know nothing of Hibernia’s fate. But for most of her passengers rescue proved not to be the end of their travails, as the treatment given them in their time of greatest need was to mirror their status as cabin or steerage ticket-holders aboard Hibernia. Tom Clark has researched both forward and back from this bizarre and improbable mid-Atlantic encounter to paint a vivid word-picture of the social conditions which placed a disparate collection of Britons on the high seas, and of the futures which awaited them on the far side of the world. 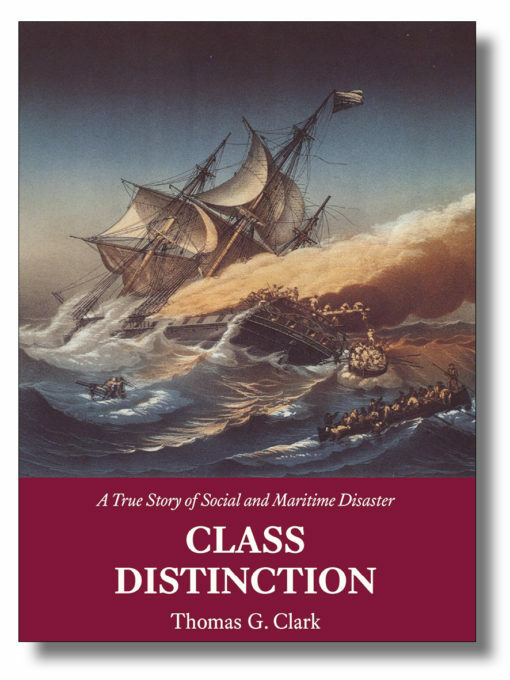 Class Distinction directs a lens at British official attitudes towards those of the underclass, be they banished to Tasmania for stealing a few onions, or steerage passengers penned below decks by their rescuers. As ever, those sufficiently privileged are due ‘every comfort, every luxury’. ISBN 978-1-907206-43-6; 216 x 156mm, 96pp. Softcover with sewn binding, cover flaps and matt lamination.